Moms that sleep train babies should be called ninjas. You bounce that little bundle until heavy eyes close, you hold your breath as you lay him down, then you quietly and quickly bolt out of the room and pray it stays quiet. I know this game all too well. I sneak out of my son’s room like it’s bugged with laser sensors. Then I’d head downstairs to do this 30 minute home HIIT workout. I never let my babies cry excessively. I had a timing system to let them fuss a bit. I need a life. Naps are essential. Period. I love my babies something FIERCE. But mom needs nap time. Me time. And often, workout time. That’s why at-home workouts are my jam. They need to be short, effective, and doable in my living room. And this 30 minute home HIIT workout fits perfectly with my criteria. So turn turn the baby monitor around, put your unwashed hair in a ponytail, and let’s get it done. 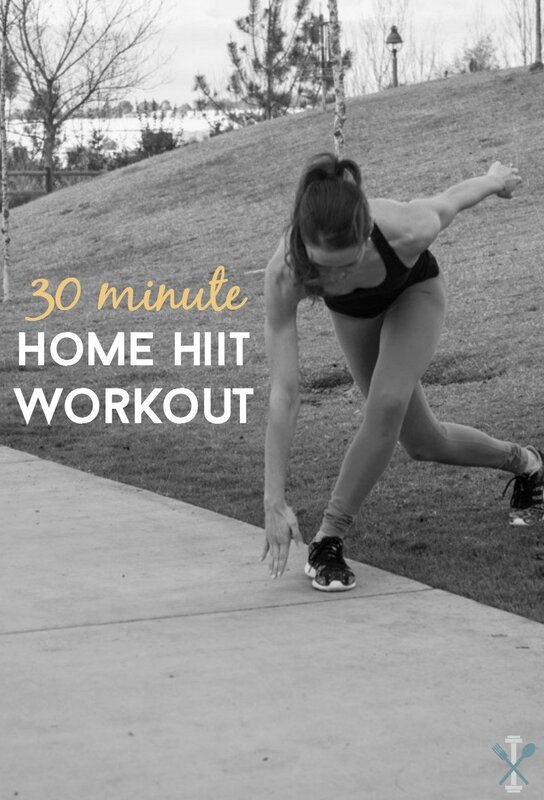 This 30 minute home HIIT workout is perfect at home (duh), in your hotel room (omg if you’re on vacation TAKE ME WITH YOU), and requires no outside equipment. Just your own body weight and a timer. And be sure to download this free PDF guide with a full tutorial for this HIIT workout and two others you can do anywhere! The PDF explains every step for this 30 minute HIIT workout, a 20 minute lower body cardio tabata workout, and a quick and dirty 7 minute HIIT workout. No searching and scouring for free workouts online – just one complete guide for the best HIIT workouts straight on your phone! Start with your feet slightly wider than shoulder-width apart, arms lifted with elbows bent in 90 degree angles, parallel with your shoulders. Hop to bring your feet and elbows to meet, then hop back out to the original position. Next, hop again as you bend your right knee in towards your chest, and swing your elbow inward, almost as if you are trying to touch your elbow to your knee. Hop back out to the original position and repeat – this time executing the “twist” with the opposite knee and elbow. Do this for 45 seconds. Then take a 15 second break. Continue for a full 3 minutes before moving on. Start with your feet hip-distance apart, hands at your sides. Bend your knees to execute a squat, being mindful not to have your knees pushed forward past your toes. Jump up to your highest vertical position and lift your arms overhead, then land back into the squat. Repeat these moves continuously for 20 seconds, then take a 10 second break for a full three minutes. Start with your left foot behind your right, weight in your standing foot (right). Reach forward with your left hand and touch your right foot. Next, using the momentum from your standing leg, jump up and out to the left side as you spread your legs. Land with your left left in front, right leg behind, and right hand reaching near your left foot. Repeat this side-to-side leap continuously for 45 seconds, then take a 15 second break. Do this for 3 total minutes. Start in a plank position, palms directly under your shoulders and feet wider than shoulder-width. Tap your left shoulder with your right hand then place your hand back to the ground. Then tap your right shoulder with your left hand and place your hand back to the ground. Next, jump your feet together, then back out, then repeat the entire sequence. Repeat this continously for 20 seconds, then take a 20 second break. 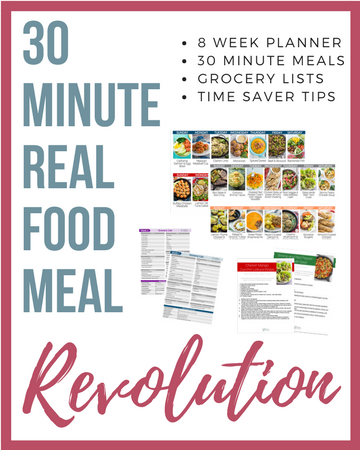 Do this for 3 total minutes. Start with your feet wider than shoulder-width apart and bend into a sumo squat, toes facing outwards and arms in a T (parallel to the ground). Next, hop your feet together, right foot in front of the left, and bring your arms in towards your chest, still extended and stacked one over the other. Hop back into the sumo squat with arms out, then repeat the criss-cross with the opposite feet. Repeat this for 45 seconds, then take a 15 second break. Do this for 3 total minutes. Repeat this entire sequence twice through for a full 30-minute workout! Why not add some strength training in the mix? Here’s a few workouts that are perfect to alternate between those hard hitting cardio days. What’s your favorite way to sneak in a workout? 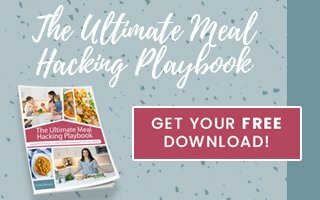 Don’t forget to snag your free home HIIT workout guide below! Hey girl, us sleep-deprived mommas need to stick together before we lose our MINDS!!!! First of all, your form is always so beautiful. And second of all I can always tell you love your babies something fierce; you truly are denying yourself and following Jesus; it makes me realize how much more selfless I want to become. I also hope you get some nap time a few of these days, so you can refill that mama cup. Amazing workout routine, Chrissa! Can’t believe that great set of workout can be done in only 30 minutes! Thank you Agness! It most certainly can, and mainly the only way fit working out in my daily life! I appreciate you stopping by! I can definitely devote 30 minutes of the day for a workout like this one, Chrissa! You are so motivational! Right on! 30 minutes is totally achievable for a quick workout! You made my day Agness! Thanks! Do you have any recommendations to replace the Plank Jack Shoulder taps? I have diastasis recti and planking is a big no no as I know you are already aware from your DR blog posts. Any help is appreciated. Or i’ll just remove that one and fill in something else I know is okay. You could just omit and do something else! Or even holding a modified side plank with one knee to the ground.